The Wimbledon tennis tournament is the oldest international tennis tournament. Created in 1877, Wimbledon takes place on an annual basis over a two-week period and puts the World's best tennis players at play. It is one of the Grand Slam tennis tournaments, along with the Australian Open, the US Open and the French Open (Roland Garros Tournament). The best tennis players take part in all of these different tournaments, and their results in one influence their image for next one, regarding international champions such as Roger Federer but also rising names such Petra Kvitovva..
Due to its specificities and traditions, Wimbledon is generally considered as the most prestigious of the Grand Slam tournaments. Besides its large surface, many specificities distinguish it from the other tournaments: the players are to dress mostly in white, no game is held on the first Sunday and there is no advertisement around the stadiums. Moreover, as the organization is held by a private club and not an international tennis federation, the Royal Family has its own box on the central court and a valet is present during the Final game. The tournament is made up of five events: Men's singles (128 players), women's singles (128 players), men's doubles (64 teams), women's doubles (64 teams), and mixed doubles (48 teams). Each year, approximately 500 000 people come to watch the games, which are divided in 19 different tennis courts. Besides the players, Wimbledon's lawn is put to honour and can be described as its real star. Indeed, the US Open and US Australia have given up playing on law (respectively in 1974 and 1988). In 2000, however, Wimbledon's lawn was changed in order to permit slower games and a higher bounce. On a statistical scale, the victory of records at Wimbledon goes to Pete Sampras and Roger Federer - who count 7 victories each - for the men, and to Martina Navratilova for the women, with 9 victories. The longest match in the history of tennis took place in Wimbledon, from June 22 - June 24 2010, between John Isner and Nicolas Mahut. It took no less than 11 hours and 5 minutes, 180 games and 980 points to distinguish a winner (6-4, 3-6, 6-7, 7-6, 70-68)... During this game, twelve tennis world records were beaten. 256 players started at SW19 last week. Now, just 32 remain - all dreaming of glory as we head into the second week of Wimbledon 2017. Bencic regressed in 2016, however if gets going in 2017 then the WTA players should take notice. From the Big 4, only Novak Djokovic doesn’t have an Olympic gold medal, but he is hoping to get one at the Rio 2016 Olympics. As Murray basks in the glory of his Wimbledon victory, his performance underlines why athletes should never give up on their dreams. Wimbledon 2016: who will come out on top between Lendl and McEnroe? As fans eagerly anticpate the final, the fascinating subplot of the coaches is even more mouthwatering than the matchup between players. After Djokovic’s surprise loss and Nadal’s injuries, Federer’s victory dispels any myths that either one of them have lost their midas touch. Australian tennis player Nick Kyrgios has responded to Dawn Fraser’s derogatory comments about his behaviour. The nation has two weeks of breath-taking tennis action to look forward to as Wimbledon takes over. Two matches in a day proved little hindrance to Andy Murray as he clinched his fourth title at the Queen’s Club. Pre- Wimbledon boosts for Rafa Nadal and Nicolas Mahut as they both clinched titles over the weekend. British women’s tennis number two was knocked out of the Nottingham Open in the quarter-finals. Serena Williams and Maria Sharapova lost in straight sets in the semi-finals at the Madrid Open. 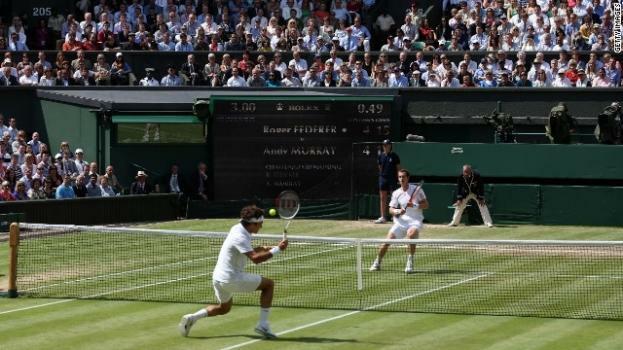 Wimbledon joins the major sporting venues that have banned the use of the photographic aids.